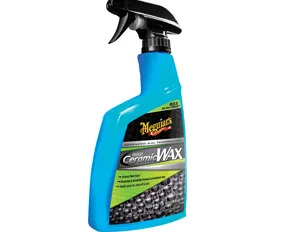 Meguiar’s Hybrid Ceramic Wax is a huge departure from traditional waxes. The hybrid ceramic wax provides more protection and durability than conventional wax by simply spraying on, rinsing off, and then drying. With all-new, advanced Si02 hybrid technology you get hybrid ceramic protection that is easy to use — you can actually wax the paint as you rinse off the car. After washing the paint and rinsing off the soap, simply spray on the Hybrid Ceramic Wax and then follow with a second rinse using a strong stream of water. This final rinse helps to spread and lay down the wax.